Roof Repair, Replacement & Exterior Renovations in Winnipeg, Manitoba. KLZ Roofing & Exteriors Ltd. Hire our roofing contractors in Winnipeg to replace shingles, to fix your roof or install a new roof. We are a full scale exterior renovation company that installs new siding, soffit & fascia. Our home improvement company has hired the top roofing contractors we could find with many years of experience and the reputation to prove it (check our roofing reviews online). Whether you need to remove/repair a portion of your roof or re-shingle your entire roof, let the experts at KLZ Roofing & Exteriors be your choice for local exterior renovations. Our list of home exterior renovation & construction services doesn’t stop at just roofing. We offer several home improvement services such as: metal roof installation, exterior siding, fascia and soffit installation, eavestroughs and gutter guards. And let’s not forget about our winters! Our roof snow and ice removal services can help to prevent damage caused by ice dams and other winter roofing issues. For your peace of mind, KLZ’s 6 year “Workmanship Warranty” is supported and extended by our manufacturers’ warranty which provides coverage from 25 years to lifetime. Get a hassle free estimate today to replace your roof in Winnipeg or rural Manitoba. East St. Paul based roofer! KLZ Roofing now offers financing for roof installations, new siding, soffit and fascia, and all of our services, for Winnipeg and surrounding areas. With this service, we can work out a payment that suits your budget and makes your home renovations a much easier decision to make! Approval takes less than 10 minutes and can be provided right on the spot during your Free Home Roofing Estimate. 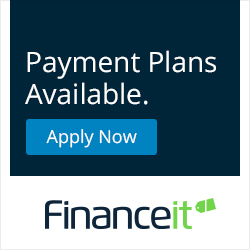 Apply now for financing by clicking below. * Financing and term is subject to credit approval by Finance-It inc.
KLZ Roofing did a good job at a fair price. KLZ Roofing & Exteriors did a good job at a fair price on our Winnipeg house and garage were done in one day! They did a great clean-up job as well. Without reservation, if you're considering having a roofing job and/or eaves done, I would recommend KLZ Roofing to do the job. They provide more than just a quality job and product at a competitive price, they provide for customer service and satisfaction. Thanks again for the prompt, efficient professional manner in which the entire process was handled. I will recommend KLZ Roofing to all my friends. They are highly skilled, efficient and professional. KLZ Roofing exceeded my expectations on quality of work, commitment and attitude. Excellent Winnipeg roofing services. Kirk from KLZ Roofing is a very honest and likeable guy that is a pleasure doing business with. Experienced roofer and does a great job!